The industrial revolution is colliding with the digital revolution. 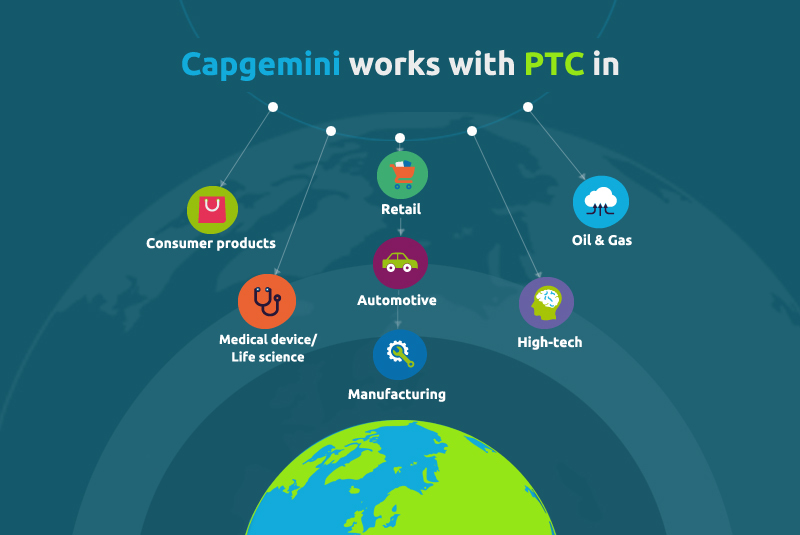 PTC’s leading industrial-innovation platform and solutions combine with Capgemini’s team to turn possibility into reality. It is the age of intelligent things. According to the Harvard Business Review, the Internet of Things is the third wave of IT-driven competition that will radically reshape industries and strategies. PTC is changing the way we create in our new interconnected world. With a unique understanding of things in their digital form, PTC has a big-picture view of how digital can advance your business today. With more than 30 years of experience, PTC is creating industrial innovations that help companies design, manufacture, operate, and service things for a smart, connected world. Capgemini has worked with PTC for more than 15 years and boasts a team of more than 650 global resources. Working with PTC and Capgemini, clients can enable digital transformations from product design through to service, breaking down existing organizational silos and processes. That collaboration decreases product development and engineering costs and increases manufacturing efficiency and quality while reducing time-to-market and after-sales service costs. Creating new revenue streams, improving customer service, and gaining insights like never before through the development of smart connected products. Capgemini in collaboration with PTC launched the Center of Excellence (CoE) for IoT at our Mumbai AIE.